Hi everybody! Happy Monday and welcome to another terrific week of What Will You Stamp? In case you're wondering what this challenge blog is all about... 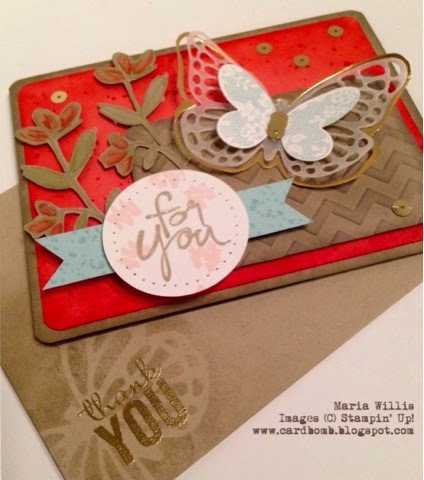 It's a weekly challenge blog that's posted every Monday and it features a different Stampin' Up! set each week. Each member of the design team will post a card or project they made using the set. 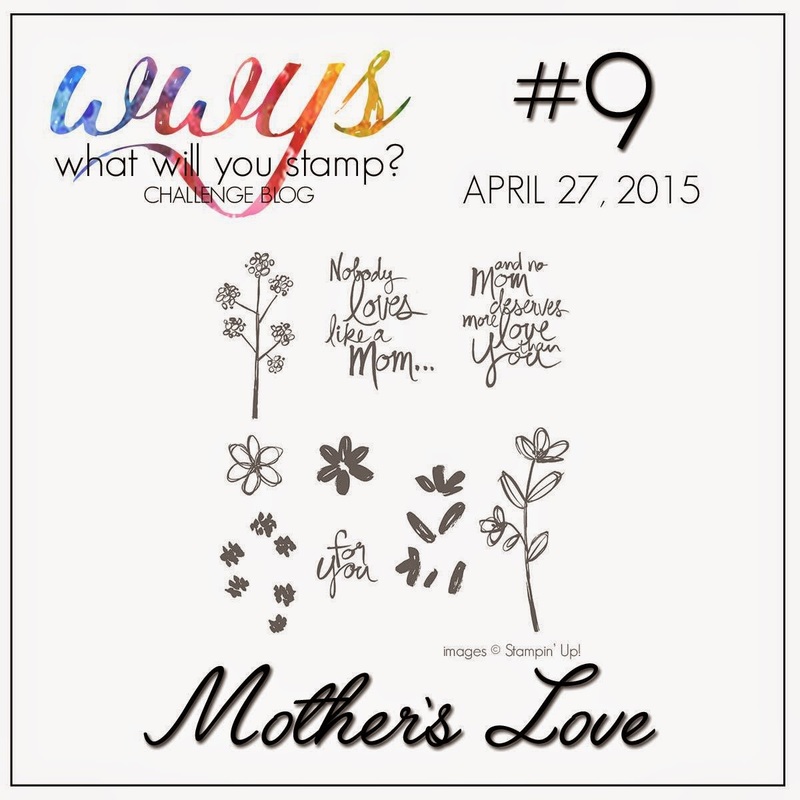 Anyone who wants to is invited to participate by submitting a card or project of their own to the What Will You Stamp Challenge Blog (Click Here). The flowers from the Mother's Love set are stamped in Pistacio Pudding on Crumb Cake card stock. Then I used my Blender Pen to color in the flowers with Calypso Coral Ink. The "For You" and those pretty pin (pirouette) background flowers are also from the set. It's hard to tell but I used some Crystal Effects to make the words shiny. I was in something of a "waste not one scrap of paper" kind of mood when I mad this and the butterflies were leftovers from another project. The middle one is wax paper (don't laugh) and the gold butterfly frame was leftover from a butterfly I had previously cut out and all I had to do was fussy cut the border out. This card needed a fancy envelope with some gold embossing to match the sequins on the card. Here's what the whole stamp set looks like. Do you have it? Play along with us this week then! I can't wait to see your creations over at WWYS! Happy crafting and have a great week! Wow Maria! 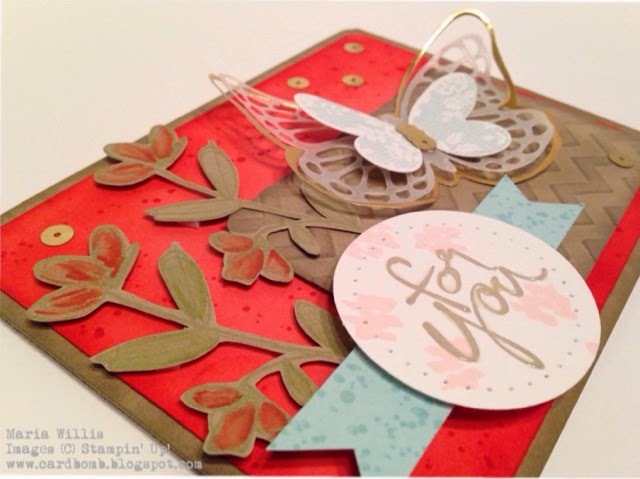 I love all the layers you have on this card and how you double dutied the butterfly diecut! 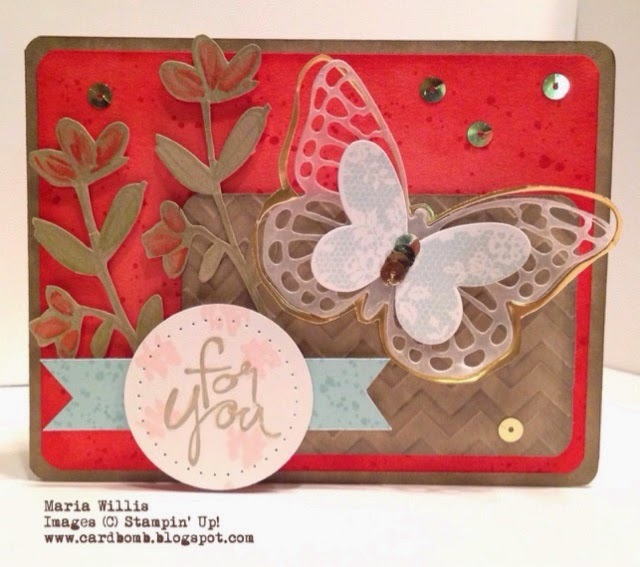 So many beautiful Elements to this card Maria!!! Oh! I so love the detail in the matching envelope too! Great job!